Top dog in trucks ready to fend off challenges by GM, FCA. Ford is ready to fend off challenges to its standing as the top producer of heavy-duty trucks. 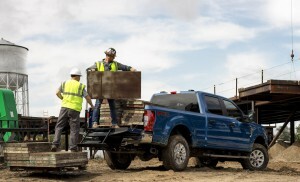 Ford aims to retain its leadership in the heavy-duty segment even as archrivals General Motors and Fiat Chrysler bring out new models to challenge Ford’s leadership. 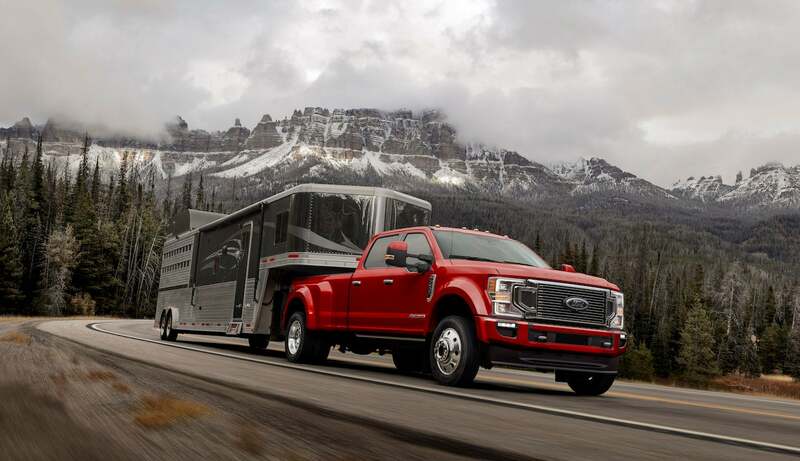 Ford is responding by unveiling the 2020 F Series Super Duty Truck that features a new 10-speed transmission, three different engines, including a new diesel engine, and a high-tech trailer back-up assistance set up to go along with more towing capacity. Kumar Galhotra, Ford president, North America, said the unveiling at the Chicago Auto Show is part of the broad product offensive the company will launch this year. 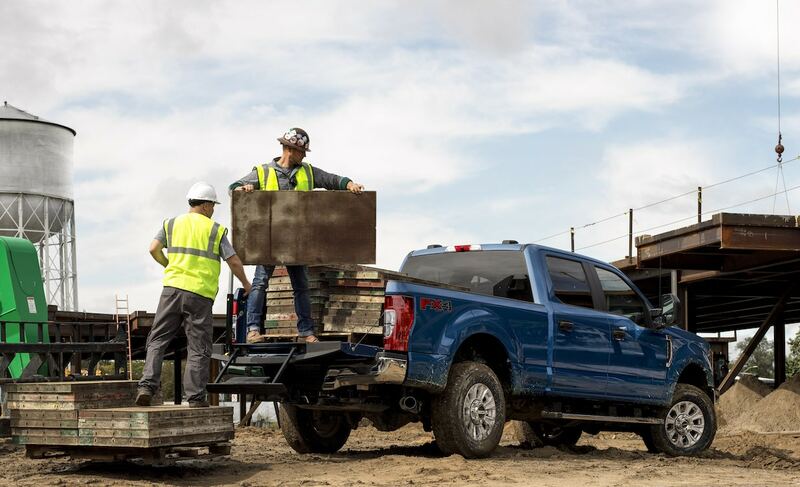 The F-250, like all levels of the heavy-duty group, offers more power and more capability for 2020. 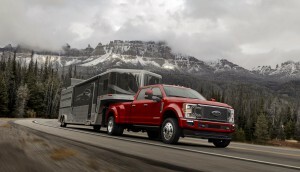 Galhotra said the 2020 Ford Super Duty has more power, more payload and towing capability and better technology than ever to help these customers build a better world. F-Series Super Duty had the largest market share in the oil and gas industry where it has 50% share, government where it has a 60% and 45% share among utility services where they are often converted to lift trucks, according IHS Markit U.S. registration data from January 2017 through November 2018. Assembled in the United States, Ford’s F-Series Super Duty is built at the Kentucky Truck Plant in Louisville and the Ohio Assembly Plant in Avon Lake. Galhotra also emphasized that Ford is also the only company that makes the engines and transmissions used in its heavy-duty trucks in house, giving it complete control over its big pickup trucks. 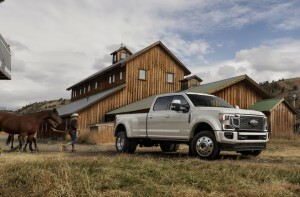 The Ford-designed and Ford-built third generation 6.7-liter Power Stroke diesel V8 is upgraded to deliver more power and torque, Ford engineers said. In addition, an all-new Ford-designed and Ford-built 7.3-liter V8 as well the standard 6.2-liter V8 are available on the Super Duty. Both engines are paired with an all-new Ford-designed and Ford-built 10-speed heavy duty TorqShift automatic transmission. Ford is the only manufacturer to design and build all of its heavy-duty engine and transmission combinations — ensuring the powertrain works seamlessly with all chassis components and vehicle calibrations. Ford offers three different engines for its heavy-duty trucks, including a diesel. “With the addition of the7.3-liter V8, upgrades to our 6.7-liter and the debut of an all-new 10-speed transmission, we are delivering the strongest, most capable Super Duty powertrain offerings yet,” said Mike Pruitt, Ford Super Duty chief engineer. The 7.3-liter gas V8 engine delivers high performance in a compact package. Super Duty’s third generation 6.7-liter Power Stroke Diesel also includes a new 36,000 psi fuel injection system with all new injectors that precisely meter and spray up to eight times per stroke to control noise levels and optimize combustion. An innovative-inboard exhaust on the diesel V8 also features a redesigned electronic-actuated variable-geometry turbocharger that provides improved pumping efficiency and throttle response. Ford also enhanced the strength of the cylinder head, block, connecting rods and bearings to handle higher cylinder pressure and increased output. New steel pistons provide higher firing pressure capacity and less friction, which improves performance and increases horsepower and torque. Pro Trailer Backup Assist allows drivers to maneuver their trailers into the tightest spots with the greatest of ease. The heavy-duty transmission continues also comes with class-exclusive live-drive power takeoff, which allows the operator to engage industrial equipment and accessories, such as snowplows, with the truck in motion. This electronically controlled transmission has selectable drive modes that include normal, tow/haul, eco, slippery, and deep sand and snow. 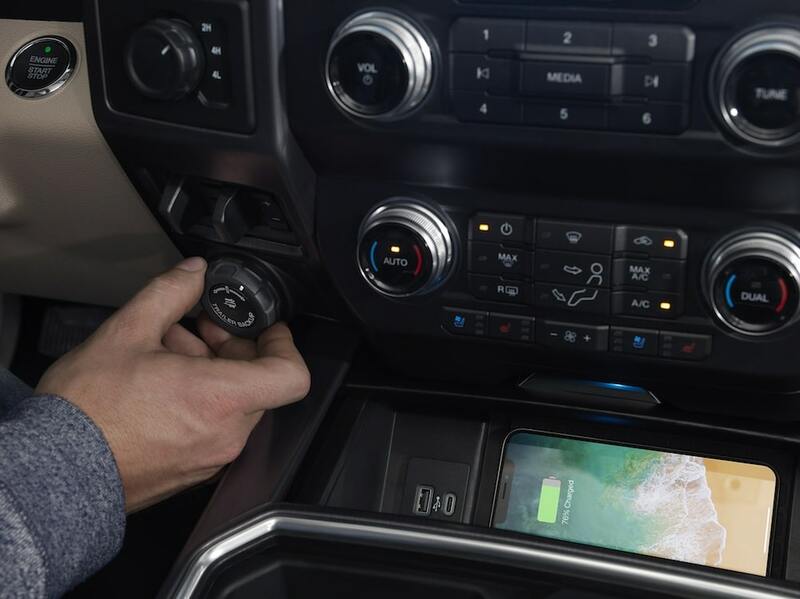 The entire unit is so cleverly engineered that–even with four extra gears–it fits in the same space as the six-speed and weighs only 3.5 pounds more. Ford is also adding technology to make the truck easier to handle. For 2020, the new Pro Trailer Backup Assist makes negotiating even the largest trailers into the tightest of spaces easier than ever before. With hands off the steering wheel, drivers use the Pro Trailer Backup Assist knob to easily steer the trailer via the reverse camera. The truck’s Trailer Reverse Guidance system shows trailer angle and direction, and provides steering suggestions to most efficiently direct a trailer backward. Both systems are built to accommodate all trailer styles, including fifth wheel and gooseneck trailers. FordPass Connect with a 4G LTE modem are standard while wireless charging for smart phones is available and driver assistance features such as automatic emergency braking are standard on XLT series and above, Ford officials said. This entry was posted on Tuesday, February 5th, 2019 at and is filed under Auto Shows, Automakers, Chicago, Executives, Ford, Personalities, Pickups, Sales, Trends, U.S./North America. You can follow any responses to this entry through the RSS 2.0 feed. Both comments and pings are currently closed.